Mothers and work: What’s ‘ideal’ ? Originally posted at Pew Research Center-Fact Tank blog. For most American mothers, part-time work would be their ideal work situation, preferred over full-time work or not working at all outside the home. However, there are sharp differences among views of mothers based on factors such as economic circumstances and marital status. Working part time has consistently been the top choice for women with at least one child under the age of 18 in the three years that the question was asked. 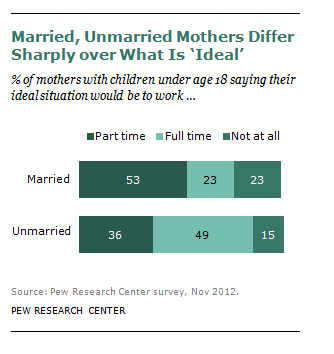 Nearly half of mothers (47%) in 2012 said that their ideal situation would be to work part time. The share was 50% in 2007 and 44% in 1997. 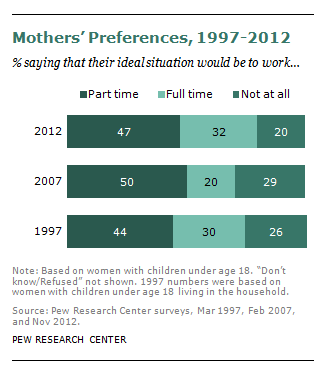 Among mothers who currently work full time, many would rather not. About 44% say that working part time would be their ideal situation, 9% say not working outside the home would be ideal. Only about half (46%) of full-time working mothers consider their current situation ideal. On the other hand, mothers who are not employed also think working part time is appealing. Fully four-in-ten say part-time work would be the ideal situation for them, 22% think working full time would be ideal, and 36% are happy with their current situation. The way mothers view their ideal work situation has fluctuated somewhat over time, and these changing preferences likely reflect changing economic circumstances. The share of mothers preferring full-time work increased sharply between 2007 and 2012 (from 20% to 32%) – an intervening period that included a severe economic recession. Mothers at the lower end of the income scale are much more likely than more affluent mothers to say that working full time would be the ideal situation for them. In 2012, some 40% of mothers with annual family incomes of less than $50,000 said full-time work would be ideal, compared with 25% of mothers with incomes of $50,000 or higher. The 2012 Pew Research survey also found that single mothers were much more likely than married mothers to say their ideal situation would be to work full time. Single mothers, often the sole provider in their household, have a much lower family income than married mothers, on average. It’s not surprising, then, that among unmarried mothers, nearly half (49%) say that their ideal situation would be to work full time, while 36% say part-time work would be ideal. In contrast, married mothers see part-time work (53%) as more desirable than full-time work (23%). The gap in views between married and unmarried mothers has widened significantly since 2007, when these two groups of mothers had more similar views about their ideal work situation. What mothers see as ideal for themselves is similar to what the general public thinks about women with young children. In the same 2012 survey, we asked the public about the ideal situation for women with young children. Nearly half (47%) of the public said that working part time is the ideal situation for women with young children, 33% said not working outside the home is ideal, and another 12% said working full time would be ideal. However, when asked about what is the ideal situation for men with young children, a vast majority of the public (70%) says that full time work is ideal. One-in-five think working part time is ideal for fathers, and only 4% say it is ideal for fathers of young children not to work outside the home. More generally, the public remains conflicted about the impact that women working for pay outside the home has on family life. Most say there are clear economic benefits for families, yet most also say the increasing number of women working for pay has made it harder for parents to raise children. And many say this has made it harder for marriages to succeed. With all the recent discussion about opting out, leaning in and breadwinner moms, these data serve as an important reminder that many factors go into a mother’s decision about whether and how much to work for pay outside the home. Categories: Family, Gender, Work | Tags: Mothers, Paid work | Permalink.